The name Summerhaus D'zign may evoke visions of a design house specialising only in Californian villas with expansive landscapes and azure swimming pools, but that could not be further from the truth. Currently one of the leading interior design consultancies in the island nation of Singapore, the boutique interior design firm is well known in the region for offering highly customised solutions for each and every type of home, regardless of the size or location. In this issue, Top 10 of Asia speaks to Larry Lim and Jess Koh, the extraordinary husband and wife team about their success and how they started. Much like most success stories, the idea of forming a noteworthy enterprise has not always been in the minds of the couple. Instead, it was a natural progression, the manifestation of long hours spent apart in offices working away for others and the thought of doing it for the rest of their lives. At that time Larry Lim had been an esteemed financial consultant, managing the personal accounts and investments of high net worth individuals in Singapore, with working experience in various banks such as Citibank and The Bank of East Asia. Meanwhile, Jess Koh already had a budding career in interior design, helping homeowners design and manage renovations of their new flats. However, both Larry and Jess grew tired of their monotonous life routines and they made the decision to ‘elope’. “We reflected on what we wanted to achieve together in life and decided that we wanted to build a legacy for our children as well as give them a head start in life. With this as the core mutual reason, we decided that we should leverage on Jess’ expertise in offering design and project management solutions complemented by my experience in the banking frontline to bring a new perspective to the interior design business model,” explains Larry. The couple has since then taken to the entrepreneurial life exceptionally well. Not only is their enterprise prominent in the country for immaculate bespoke design solutions that accommodate to specific, individual tastes of the clients, the firm is also renowned for the accolades amassed in the few years since its formation in 2012. Recently, Summerhaus D'zign was awarded the Singapore Outstanding Enterprise award in December 2014, alongside some of the more established firms in the country. Besides that, a project executed by the firm is currently one of the nominees for the prestigious Italian A'Design Award, pending results' announcement in April this year, with a gala night scheduled to be held at Como, Italy. Such achievements which assert Singapore as a global design hub would have been unattainable unless precedented by hard work and perseverance, as it the case with Larry and Jess. Albeit starting out without a strong portfolio to rely on, the new start-up quickly managed to establish itself as a leading ID firm owing to the duo's relentless approach in providing excellent customer service. Besides service quality which built confidence amongst clients and gained referrals, they also channelled a sizeable percentage into marketing and branding. 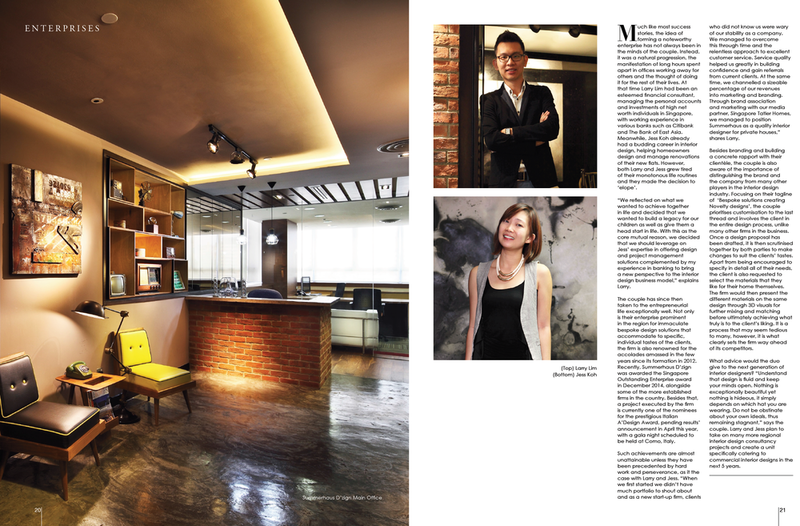 “Through brand association and marketing with our media partner, Singapore Tatler Homes, we managed to position Summerhaus as a quality interior designer for private houses,” shares Larry. Besides branding and building a concrete rapport with their clientèle, the couple is also aware of the importance of distinguishing the brand and the company from many other players in the interior design industry. Focusing on their tagline of“Bespoke  Novelty”, Summerhaus D'zign prioritises customisation to the last thread and involves the client in the entire design process, unlike many other firms in the business. Once a design proposal has been drafted, it is then scrutinised together by both parties to make changes to suit the clients' tastes. Apart from being encouraged to specify in detail all of their needs, the client is also requested to select the materials that they like for their home themselves. The firm would then present the different materials on the same design through 3D visuals for further mixing and matching before ultimately achieving what truly is to the client's liking. It is a process that may seem tedious to many, however, it is what clearly sets the firm way ahead of its competitors. What advice would the duo give to the next generation of interior designers? “Understand that design is fluid and keep your minds open. Nothing is exceptionally beautiful yet nothing is unsightly, it simply depends on which hat you are wearing. Do not be obstinate about your own ideals, thereby remaining stagnant,” says the couple. In the next 5 years Larry and Jess plan to take on many more regional interior design consultancy projects and create a unit specifically catering to commercial interior designs, firmly securing their place in the global design stage.